Should You Sell Terra Nitrogen Today? Should you sell Terra Nitrogen (NYSE: TNH) today? The decision to sell a stock you've researched and followed for months or years is never easy. But if you fall in love with your stock holdings, you risk becoming vulnerable to confirmation bias -- listening only to information that supports your theories, and rejecting any contradictions. In 2004, longtime Fool Bill Mann called confirmation bias one of the most dangerous components of investing. This warning has helped my own investing throughout the Great Recession. Now I want to help you identify potential sell signs on popular stocks within our 4-million-strong Fool.com community. Today I'm laser-focused on Terra Nitrogen, ready to evaluate its price, valuation, margins, and liquidity. Let's get started! Over the past 12 months, Terra Nitrogen has risen 26.1% versus an S&P 500 return of 13.7%. Investors have every reason to be proud of their returns, but is it time to take some off the top? Not necessarily. Short-term outperformance alone is not a sell sign, and the market may be just beginning to realize the true, intrinsic value of Terra Nitrogen. For historical context, let's compare Terra Nitrogen's recent price with its 52-week and five-year highs. I've also included a few other businesses in the same industry or a related one. As you can see, Terra Nitrogen is down from its 52-week high. If you bought near the peak, now's the time to think back to why you bought it in the first place. If your reasons still hold true, you shouldn't sell based on this information alone. First up, we'll get a rough idea of Terra Nitrogen's valuation. I'm comparing Terra Nitrogen's recent P/E ratio of 10.2 with where it's been over the past five years. Terra Nitrogen's P/E is lower than its four-year average, a potential indication that the stock is undervalued. 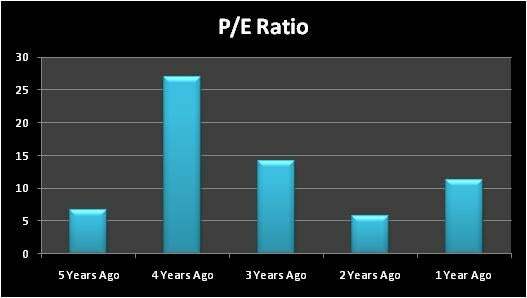 A low P/E isn't always a good sign, since the market may be lowering its valuation of the company because of less attractive growth prospects. But it does indicate that, on a purely historical basis, Terra Nitrogen looks cheap. Now let's look at the gross-margin trend, which represents the amount of profit a company makes for each $1 in sales, after deducting all costs directly related to that sale. A deteriorating gross margin over time can indicate that competition has forced the company to lower prices, that it can't control costs, or that its whole industry's facing tough times. 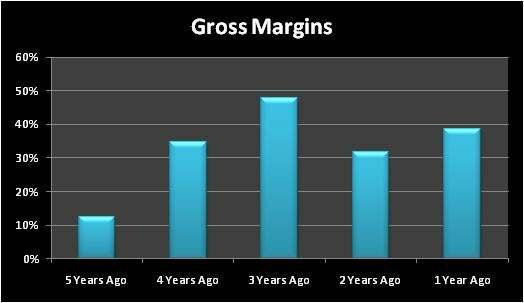 Here's Terra Nitrogen's gross margin over the past five years. Terra Nitrogen has been able to grow its gross margin, which tends to dictate a company's overall profitability. This is great news; however, investors need to keep an eye on this metric over the coming quarters. If margins begin to dip, you'll want to know why. Next, let's explore what other investors think about Terra Nitrogen. We love the contrarian view here at Fool.com, but we don't mind cheating off our neighbors every once in a while. For this portion of our research, we'll examine two metrics: Motley Fool CAPS ratings and short interest. The former tells us how Fool.com's 170,000-strong community of individual analysts rates the stock, and the latter shows what proportion of investors is betting that the stock will fall. I'm including other peer companies once again for context. The Fool community is rather bullish on Terra Nitrogen. We typically like to see our stocks rated at four or five stars. Anything below that level is a less-than-bullish indicator. I highly recommend that you visit Terra Nitrogen's stock-pitch page to see the verbatim reasons behind the ratings. Here, short interest is at a mere 0.2%. A number like this typically indicates that few large institutional investors are betting against the stock. The last metric I like to look at is the current ratio, which lets investors judge a company's short-term liquidity. If Terra Nitrogen had to convert its current assets to cash in one year, how many times over could it cover its current liabilities? As of the last filing, the company had a current ratio of 2.24. This is a healthy sign. I like to see companies with current ratios equal to or greater than 1.5. Finally, it's highly beneficial to determine whether Terra Nitrogen belongs in your portfolio -- and to know how many similar businesses already occupy your stable of investments. If you haven't already, be sure to put your tickers into Fool.com's free portfolio tracker, My Watchlist. You can get started right away by adding Terra Nitrogen. Terra Nitrogen has failed none of the quick tests that would make it a sell. Does that mean you should hold your shares? Not necessarily. Just keep your eye on these trends over the coming quarters. Remember to add Terra Nitrogen to My Watchlist to help you keep track of all our coverage of the company on Fool.com.